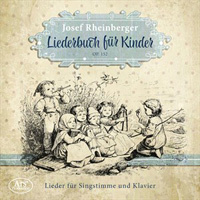 Description: Dating from 1887, this is a group of 30 songs to various texts portraying scenes from the lives of children and everything is gentle, comforting and bright even when the texts are melancholy. And, in a sort of “authentic performance” kind of way, young professional sopranos have been used all of whom come from the general area where Rheinberger lived and worked (!). German texts. 8 different sopranos, Philipp Heiß (piano).